Another wildly successful year in varsity sports at Humber College was celebrated last Thursday as contributions both on and off the courts and fields were recognized. 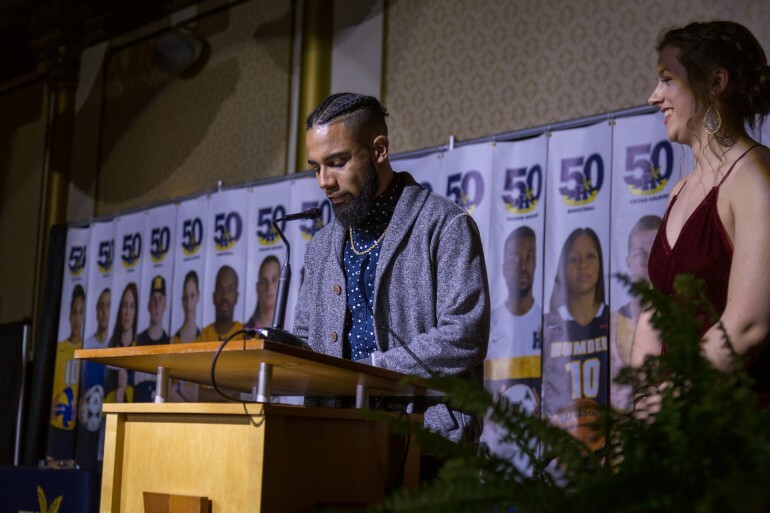 Dozens of Humber varsity athletes and staff were honoured for their work at the banquet, held at the Rose Garden Banquet Hall in Etobicoke, which saw over 80 people receive awards, honours, and merits. The honours awarded ranged from the standard recognizing of Athletes of the Year to team MVPs to coach’s picks. Among the night’s award winners were soccer player Kingsley Boasiako and golfer Connor Watt, who both received Male Athlete of the Year honours, and Ceejay Nofuente and Aleena Domingo, whose efforts in women’s basketball earned them Female Athlete of the Year recognition. Jim Bialek, Humber’s manager of Athletics and Sports Information, said the way Humber organizes its varsity awards is unique. “Coaches are allowed to pick their most valuable player, and, here’s the really neat thing about our award’s presentation — they’re allowed to pick and honour one more player on their team,” he said. “Their other choice could be their iron man award, their sportsman-like player, their most improved. Their second award is whatever they may want it to be,” he said. Bialek said this allows for Humber’s recognition of their athletes and personnel to go beyond simply what is expected. “This allows coaches to be creative, to honour players who have gone above and beyond in whatever category,” he said. The unique recognition that Humber awards goes beyond coaches’ picks. The varsity awards also honour the people that work behind the scenes. “We actually honour those who present programs, and promote programs, and report programs. Which is something really unique to Humber,” he said. These staff awards can go beyond those solely meant for them as well. The Athletic Director’s Pick, awarded to a person the director deems special, is no longer solely given to athletes. “For the first time ever, [one of] our Athletic Director Picks was a non-athlete,” Bialek said. That recipient was Josh Vatcher, recognized for his role as the president of Humber’s Student Athletic Association. The final honours given were the Varsity Valedictorians, who this year were graduating athletes Jake Thomson, a cross country runner, and Brynne Spence-Coleman, with the volleyball team. In an emotional speech that capped off the evening, Thomson and Spence-Coleman shared their memories at Humber and what the school means to them. Bialek believes its these final words that truly make Humber’s varsity awards unlike any others.